Today is a beautiful day to sit out on my porch!! A little bit chilly, but sunny and beautiful! 2. If I can't wear jeans, I typically wear a skirt or dress. I don't care for dress pants, they always feel too tight one me. I do love long skirts, so comfy! 3. I use a regular toothbrush, but it was a review one called a Radius, and it doesn't actually look normal. I love it! 4. We used to decorate boxes in school and every kid would bring those cute valentines cards to trade. That was so fun. My kids are homeschooled and they don't get to do that much. Sometimes at church or homeschool group we will trade cards. I bought each of my guys a card this year to give to them and we made a cute craft yesterday to help celebrate. 5. If I could learn a new craft it would be more to gain knowledge in one I know some of. I know how to crochet straight lines and make blankets. I have been working on making granny squares, which are supposed to be 'squares', while mine look too much like circles. I would love to do better at crochet! 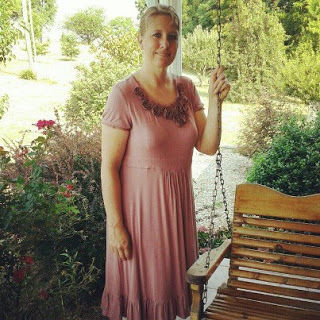 Click on the porch swing above to go and see what other friends are saying today during our chat. See you next Tues on the porch! Oh that puppy photo was so cute. I had a Bichon for 15 years. he was a GREAT dog. I still miss him. Have fun with your puppy. Your puppy is ADORABLE! Sarah or Esther? Just guessing... I like long skirts and boots a lot. Happy Valentine's Day! Show us pictures of your new little puppy when you get it home. You'll get lots of "Aww" comments. I am in love with your Christmas/Valentine puppy. What a doll! As for your Granny not-so-square, if you wash them and block them they will probably be just fine. You might try using the next larger size crochet hook - just a guess! ωith SEO? I'm trying to get my blog to rank for some targeted keywords but I'm nοt ѕeeing νeгy goоd results. OH your puppy is just SO adorable!! She looks a lot like our dog. She looks like a Delilah? I am also learning crochet. I can so far only do the straight stitch. I find it hard to do the counted stitches. I get distracted.